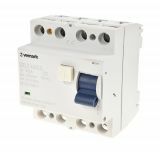 Residual Current Circuit Breaker F362 230VAC 40А 30mА This residual current circuit breaker 40 A 380 VAC / 30 mA is designed for protection from current leakage. Residual Current Circuit Breaker F362 230VAC 63А 300mА This residual current circuit breaker 63 A 230 VAC / 300 mA is designed for protection from current leakage. List Price 18.90лв. VAT Incl. 17.95лв. VAT Incl. 17.01лв. VAT Incl. 16.06лв. VAT Incl. Residual Current Circuit Breaker F362 230VAC 63А 30mА This residual current circuit breaker 63 A 230 VAC / 30 mA is designed for protection from current leakage. Residual Current Circuit Breaker (RCCB) F362, 40 A, 300 mA Residual Current Circuit Breaker is used as additional protection from unsafe contact of people with elements under load. Model F362 with voltage 230 VAC, 40 A. Residual Current Circuit Breaker (RCCB) 2P GDL7-63, 230 VAC, 25 А, 15 mА Residual Current Circuit Breaker is used as additional protection from unsafe contact of people with elements under load. Model GDL7-63 with voltage 230 VAC, 25 A. Residual Current Circuit Breaker (RCCB) 4P F364, 230 VAC, 40 А, 30 mА Residual Current Circuit Breaker is used as additional protection from unsafe contact of people with elements under load. Model F364 with voltage 380 VAC, 40 A. Residual Current Circuit Breaker (RCCB) 4P F364 230VAC 63А 300mА This residual current circuit breaker 63 A 380 VAC / 300 mA is designed for protection from current leakage. List Price 28.90лв. VAT Incl. 27.45лв. VAT Incl. 26.00лв. VAT Incl. 24.56лв. VAT Incl. Residual Current Circuit Breaker (RCCB) A9R50240 IDK 2P, AC-type, 230VAC/ 40A/ 30mA, Schneider Residual Current Circuit Breaker is used as additional protection from unsafe contact of people with elements under load. Model A9R50240 with voltage 230 VAC, 40 A. Residual Current Circuit Breaker (RCCB) DPN N Vigi, 1P+N, 25A, 30mA, A9D34625 The residual current device A9D34625 provide complete protection against overcurrents, insulation faults and electric shocks by direct and indirect contacts. List Price 69.00лв. VAT Incl. 65.55лв. VAT Incl. Residual Current Circuit Breaker (RCCB) DPN N Vigi 2P, 16 A, 30 mA, AC Residual Current Circuit Breaker A9D34616 is used as additional protection from unsafe contact of people with elements under load. Model DPNa Vigi with voltage 230 VAC, 16 A. Earth leakage protection F362, 230 VAC, 25 А, 30 mА Safety switch is used as additional protection from unsafe contact of people with elements under load. Model F362 with voltage 230 VAC, current rating 25 A. Earth leakage protection CDL10LE-63, 230 VAC, 16 А, 30 mА Earth leakage protection device is designed for protection against insulation damage of installations and and direct contact with exposed conductive parts. Model CDL10LE-63, voltage 230 VAC, 16 A. Residual Current Circuit Breaker (RCCB) 4P F364, 230 VAC, 25 А, 30 mА Residual Current Circuit Breaker is used as additional protection from unsafe contact of people with elements under load. Model F364 with voltage 380 VAC, 25 A. Residual Current Circuit Breaker (RCCB) 4P F364 230VAC 63А 30mА This residual current circuit breaker 63 A 380 VAC / 30 mA is designed for protection from current leakage. A residual-current device/breaker (RCD), or residual-current circuit breaker (RCCB) or Safety Switch, is an electrical wiring device. It gets installed in the electrical panels of residential and industrial buildings and disconnects a circuit whenever it detects that the electric current between the energized conductor and the return neutral conductor is unbalanced. Such an imbalance may indicate current leakage through the body of a person who is grounded and accidentally touching the energized part of the circuit. A deadly shock can result from these conditions. RCDs are designed to disconnect quickly enough to prevent injury caused by such shocks. They also can prevent development of causing fire conditions.